Matt Cruse, hero of the wildly popular Airborn and Skybreaker, is back and this time he's aiming for the stars. But before Matt can join the first mission to space he must survive rigorous training-training made more dangerous by terrorists who are bent on sabotaging the mission before it can begin. 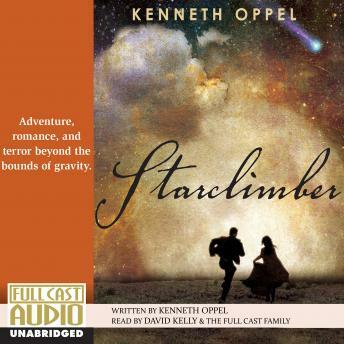 Aboard the audaciously conceived Starclimber Matt finds himself part of a remarkable crew that includes his girlfriend, the charming-but-maddening Kate de Vries-as well as ship's creator Dr. Turgenev, the irascible Chef Vlad, world-famous photographer Evelyn Karr, and Haiku, a farting monkey. Adventure, danger, and suspense abound as the intrepid voyagers discover unexpected wonders and life-threatening surprises in the world beyond the sky. Deftly balancing humor, romance, and stunning action sequences, Kenneth Oppel has once again created a masterful adventure that will sweep listeners away from earthly cares and set their spirits soaring.